Today, we bring you a message by Dr. Terence Mournet. The message was recorded on Wednesday February 25, 2015 during our Seminary Chapel. Dr. Mournet sees his position at the seminary as a life-giving cycle of service. Students and colleagues form a supportive, diverse, and vibrant community, which enables Dr. Mournet to strive for his personal and professional goals. In turn, he is able to serve students and God with his gifts of teaching, writing, and scholarly research. Students appreciate Dr. Mournet’s consistency in expectations and his ability to lead class discussions that fully communicate the topic at hand. They find that he is eager to build relationships both in and out of the classroom. In addition to teaching, Dr. Mournet has a passion for worship. He loves working with fellow musicians as they, together, seek to direct people’s attention towards worship of the one, true God. He plays numerous instruments, including electric and acoustic guitar, bass guitar, drums, and trumpet. Dr. Mournet also likes to express himself through painting, sketching, and other artistic pursuits. To top it all off, he has extensive home-renovating experience – something that was likely passed down through his DNA, as his father was a carpenter and construction foreman. Dr. Mournet is married to his wonderful wife, Krista, who serves alongside him in leading worship at their home church. The Mournets have one son, Lucas. 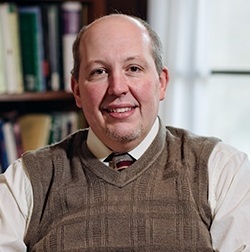 Terence C. Mournet, PhD is Associate Professor of New Testament and Greek at Ashland Theological Seminary. Next Next post: Who were you created to be?